Three of these Wogglebugs ran between 1917 and 1925. The extensive web of trolley lines that connected the countryside in the early 20th century has left its mark on the landscape, if you know where to look. 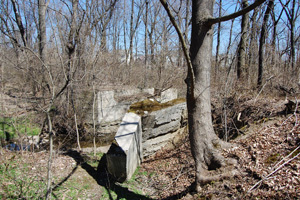 Bridge abutments, occasional buildings, and earthwork rights-of-way are evidence left by abandoned trolley lines. As suburban sprawl develops the roadsides, more of this evidence is lost with each passing year (or with each passing week, or so it seems). Infrastructure of the long-abandoned Montgomery County Rapid Transit Company remains, in several places in Lower Salford, Skippack, Worcester, and Lower Providence townships, Pennsylvania. The Montgomery County Rapid Transit Company was somewhat late in starting trolley service. The company was incorporated in 1902, with trolleys finally running to Worcester five years later in 1907. 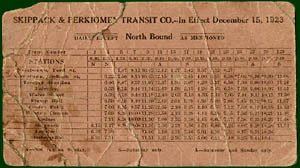 In 1908 service was extended to Skippack. The final extension, through Lederach to Harleysville, opened for service in 1912. Miles from the nearest railroad, this trolley brought convenient transportation to a lightly populated, agricultural landscape. 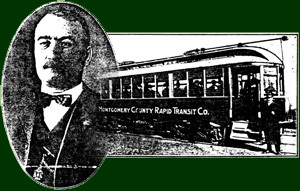 Click here for a wonderfully descriptive 1908 advertisement about the Montgomery County Rapid Transit Company trolley line that appeared in the Philadelphia Record newspaper, published in an effort to attract investors. Fireworks at Opening of Trolley Road. 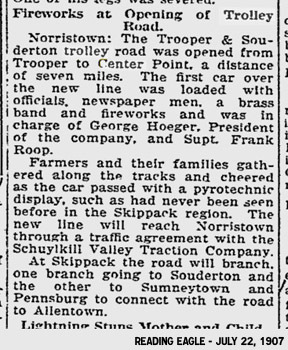 Norristown: The Trooper & Souderton trolley road was opened from Trooper to Center Point, a distance of seven miles. The first car was loaded with officials, newspaper men, a brass band and fireworks and was in charge of George Hoeger, President of the company, and Supt. Frank Roop. Farmers and their families gathered along the tracks and cheered as the car passed with a pyrotechnic display, such as had never been seen before in the Skippack region. The new line will reach Norristown through a traffic agreement with the Schuylkill Valley Traction Company. At Skippack the road will branch, one branch going to Souderton and the other to Sumneytown and Pennsburg to connect with the road to Allentown. A 1919 list of trolley stops can be found here. Follow this link to a detailed map of the Montgomery County Rapid Transit Company trolley. Called the "Wogglebug" by locals, it was never a particularly successful trolley line, in part because the line was never completed. Intended to link Norristown with Souderton (and eventually Doylestown), only twelve miles of track was constructed, with service reaching no farther than Harleysville. Some construction was done north from Harleysville in 1916, but this work was never completed. Proposed branches from Lederach to Pennsburg, and from Harleysville to Kulpsville were surveyed but never built. Many trolley companies earned extra revenue by carrying freight, small parcels and U.S. Mail. 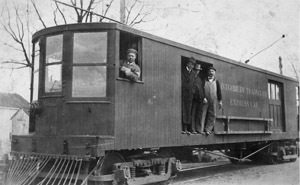 Montgomery County Rapid Transit Company owned a large freight trolley to provide freight service; a stone freight station was built at Harleysville. Trolley freight service was a valuable resource for the farmers, small industries, and storekeepers along the line. Special trolleys delivered stone for construction projects from the company-owned quarry just north of Lederach. Customers included the state highway department which incorporated many tons of crushed stone into highway improvements. In 1911 the company was reorganized and its name shortened to Montgomery Transit Company. 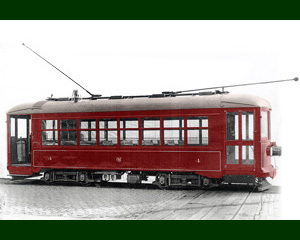 1917 saw MTCo's fleet of large old railroad-style trolley cars replaced with three modern steel trolleys from J. G. Brill Company. 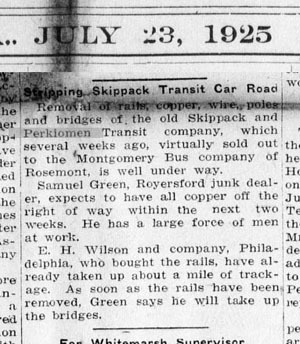 In the early 1920s the company name changed again, to Skippack and Perkiomen Transit. Unfortunately the small towns of Center Point, Skippack and Lederach were simply not populous enough to generate sufficient passenger or freight traffic to make the line profitable. 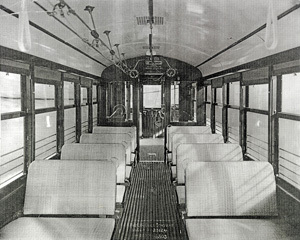 Rumors of imminent abandonment of trolley service began circulating in early 1922. A January 26, 1922 article in the Reading Eagle pointed out that "persons residing along the trolley line would be placed under a serious handicap should the trolley road be discontinued, as they have no other means of reaching Norristown unless they use autos." 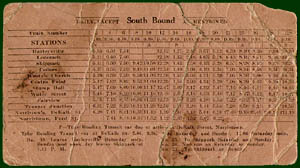 This schedule shows that by 1923 less than a dozen round trips were scheduled over the line on weekdays. Click on the schedules to see larger views. 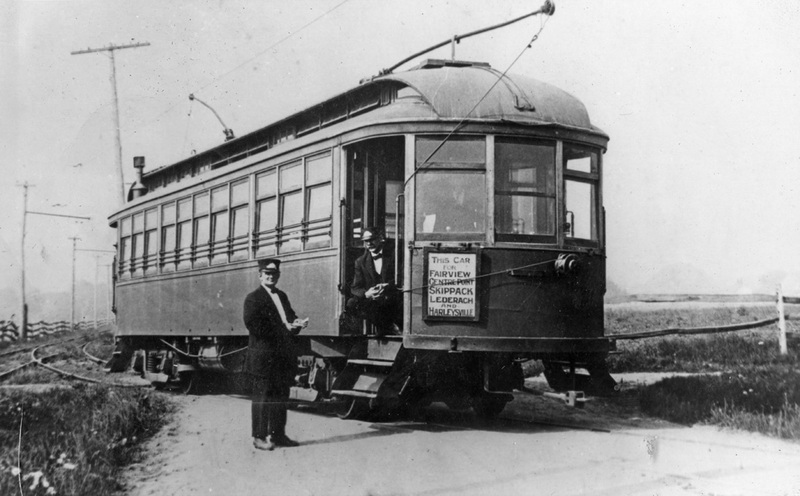 The last trolley car ran on June 7, 1925. Removal of rails, copper wire, poles and bridges of the old Skippack and Perkiomen Transit company, which several weeks ago, virtually sold out to the Montgomery Bus company of Rosemont, is well under way. 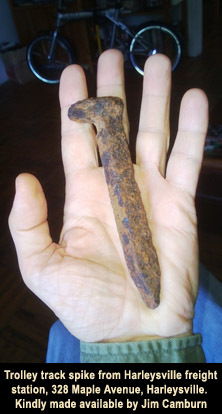 Samuel Green, Royersford junk dealer, expects to have all copper off the right of way within the next two weeks. He has a large force of men at work. E. H. Wilson and company, Philadelphia, who bought the rails, have already taken up about a mile of trackage. As soon as the rails have been removed, Green says he will take up the bridges. 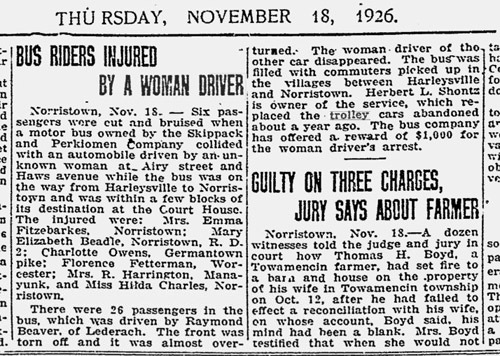 After abandonment, bus service was implemented, as evidenced by this 1926 newspaper article about an accident involving a Skippack & Perkiomen bus. No less than four operators tried to run the bus line but none could turn a profit and service ended in 1940. Norristown, Nov. 18. -- Six passengers were cut and bruised when a motor bus owned by the Skippack and Perkiomen Company collided with an automobile driven by an unknown woman at Airy Street and Haws Avenue while the bus was on the way from Harleysville to Norristown and was within a few blocks of its destination at the Court House. The injured were: Mrs. Emma Fitzebarkes, Norristown; Mary Elizabeth Beadle, Norristown, R. D. 2; Charlotte Owens, Germantown Pike; Florence Fetterman, Worcester; Mrs. R. Harrington, Manayunk; and Miss Hilda Charles, Norristown. There were 26 passengers in the bus, which was driven by Raymond Beaver, of Lederach. The front was torn off and it was almost over-turned. The woman driver of the other car disappeared. The bus was filled with commuters picked up in the villages between Harleysville and Norristown. Herbert L. Shontz is owner of the service, which replaced the trolley cars abandoned about a year ago. The bus company has offered a reward of $1,000 for the woman driver's arrest. As development continues to pour more and more automobiles onto suburban roads, traffic congestion wastes more of our time. If we live in or near Worcester, chances are we get around in our cars. There's simply no choice. The better quality-of-life alternative of leaving the car at home (or parked at a station) and riding the trolley to work or school or shopping just doesn't exist. Any more. Seeing these concrete remnants of a long-lost trolley system might remind us of the choices we've lost.